PET is a common plastic material for many beauty and cosmetic packaging designs. It is light, highly transparent, shatter-proof, non-toxic, and chemically compatible with many formulations. 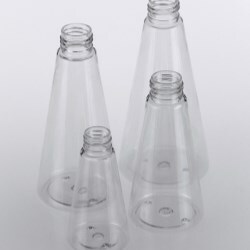 SR Packaging’s new SD series PET packaging bottle offers a conical design. With a sturdy base, the SD series offers an elegant and simple shape that is perfect for skin care, cosmetic, hair care, and many personal hygiene products. The SD series offers capacities of 60ml, 120ml, 180ml, and 240ml, and can be created in completely transparent or any opaque color. It can be decorated with hot stamping, silk screen printing, labeling, metallization, and many more printing technologies to create a unique branded product.